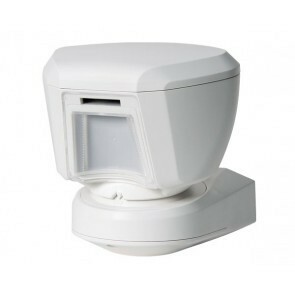 Visonic wireless alarm solution comes with a number of different types of sensors that are powered by replaceable Lithium Ion batteries, that will last for 2 to 3 years of usage on average. 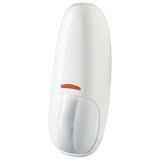 The wireless alarm panel monitors each and every sensor and will alert you if the battery of any sensor runs low. Further battery life saving options is available if you are using the PowerG solution - because of the 2-way communications, the sensors can be placed on "sleep" mode and detects only when the system is armed. This will extend battery life to up to an amazing 5 years! This industry smallest and most elegant motion sensor is one of our favourite sensors for protecting windows and glass sliding doors or glass panels. Because it detects motion across a vertical plane (similar to the curtain across your windows or doors) it offers some unique usage. For example it offers better protection then magnetic contact sensors when used across windows or glass doors, where the burglar may break the glass instead of trying to open the window- this is because it will detect movement across the window. Conversely it allows users to arm the system even if the window is not close - this is often use in the bathroom with ventilation windows. 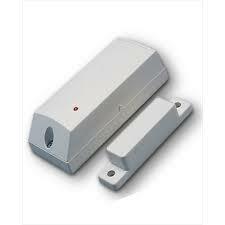 The CLIP curtain sensors can be configured for a range of 2m, 4m or 6m. 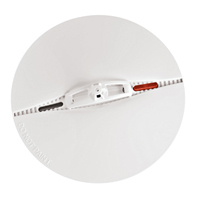 This versatile door or window contact sensor can be used either standalone or diasy-chained to a series of normal wired sensors. This allows it to be used to extend the number of sensors in a zone or to convert and existing wired system to a wireless system. As with all Visonic sensors, it also comes with a smart anti-collision algorithm which prevents signal jamming from simultaneous transmission from multiple deivices. 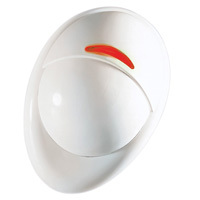 Among the many PIR or motions sensors available from Visonic is one which is immune to small pets of up to 35kg. This allows your pet to wonder about indoors without triggering the system. Of course this must be used strategically in locations together with other non-pet tolerant sensors for optimum protection. Given the number of household fires in a year, it will be prudent to add this robust and reliable smoke detector to the system, providing you with peace of mind. This smoke detector comes with its own built-in siren which will provide you a surround warning in the unfortunate event of a fire. Not many of us realise the challenges in building a reliable outdoor motion detection sensor. You have many possibility of environmental changes that may defeat the system giving rise to a false alarm. These may include rain, falling leaves, sudden cloud cover, or birds. The intruder may also attempt to spray paint on the lens of the detector. Well the good news is all these interference won't defeat the Tower20!. Best of all its also battery powered so no messy wiring to the outside of your house.